There’s only 6 weeks until the release of The Last Viking Returns (Sept 1st), and each week until then I’ll show some more behind-the-scenes images. 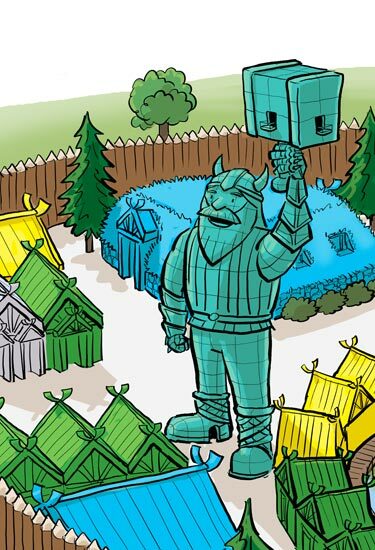 I’m going to focus on one of the main settings in the book – a theme park called Viking World. The theme park has a massive statue of Thor. Patrons are able to climb the stairs inside the statue; there are viewing platforms inside his mouth and the hammer. Naturally, the statue is closed during thunderstorms. 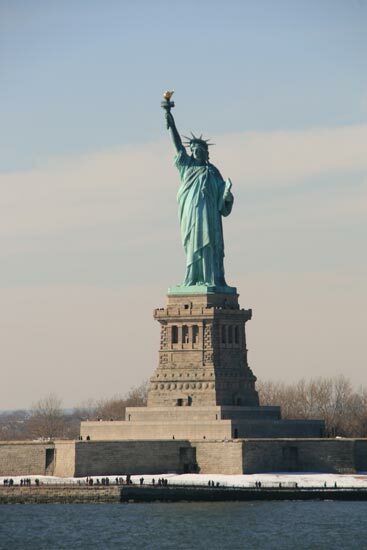 The most obvious influence for the statue is New York’s Statue of Liberty, which I ferried past a few years ago. Turned out it wasn’t very big – smaller than my head, in fact. Categories: illustration, influences, Research, The Last Viking 2 | Tags: Fremantle Press, James Foley, Norman Jorgensen, Sentosa, Singapore, Statue of Liberty, The Last Viking Returns, Universal Studios, Viking World | Permalink. 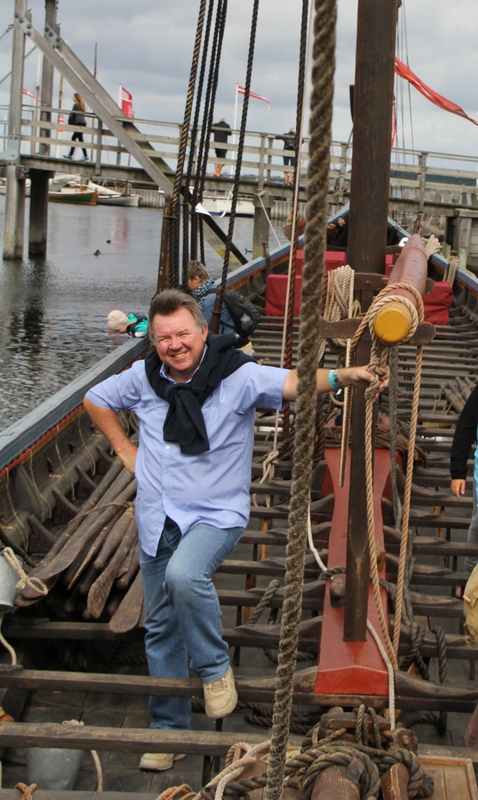 In my selfless, yet relentless search for the Viking vibe to keep my section of this blog reasonably interesting, last year I set off, entirely on your behalf of course, to visit the Viking Museum at Roskilde, about half an hour on the train from Copenhagen and located on the harbourside there, so I could tell you what it was like. 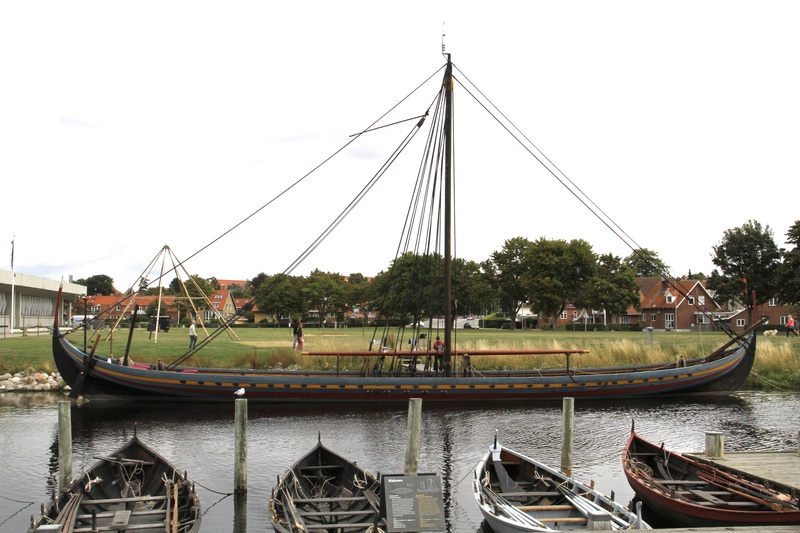 Roskilde is a seriously historic place, being not only the one-time capital of Denmark, but also burial place of many Viking kings. The Christian ones, at least. 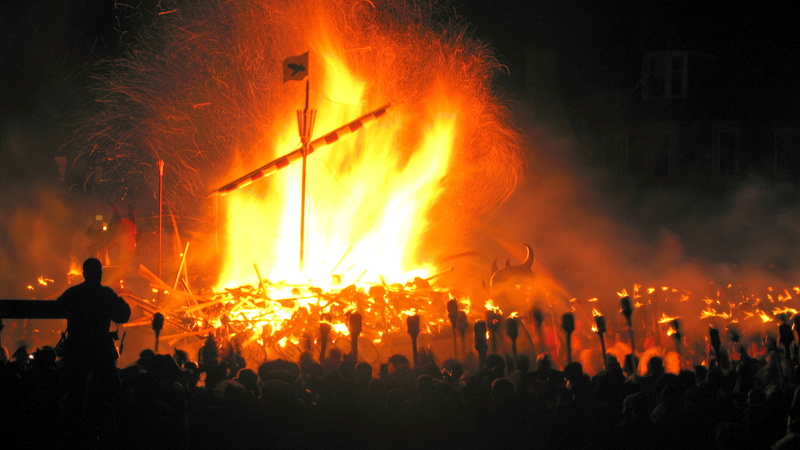 Before the Viking world deserted the Norse Gods and converted to Christianity, newly dead Viking kings would have been launched to sea on burning longships, or buried in ship-shaped mounds along with their treasures and occasional slave girl to keep them company on their journey to Valhalla, the home of heroes. 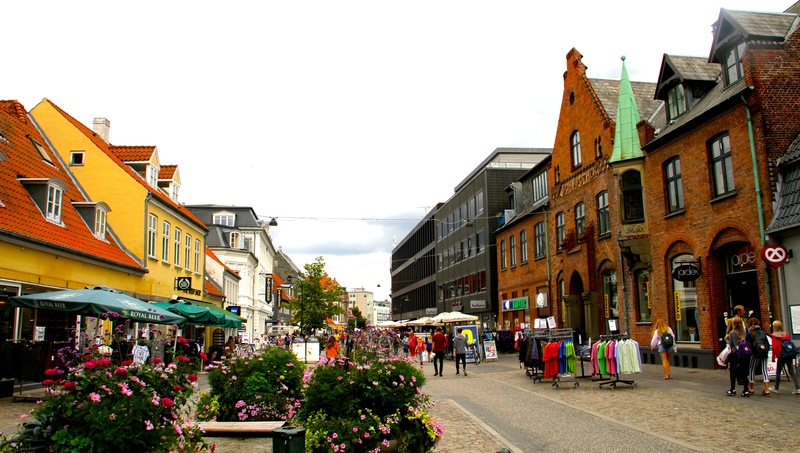 Now days, Roskilde is a very pleasant town with stylish and expensive shops either side of a wide main street with countless bicycle racks, like most of Denmark. You pass a lovely old cathedral that dominates the end of town, a helpful visitor centre nearby, and quaint houses, and a tree-lined walk through a park on your way down to the sea. The harbour is almost dwarfed by a massive new glass building of the museum off to one side, but before you get there, you immediately see a whole flotilla of menacing, but oh so beautiful, Viking longships in various sizes moored. I instantly felt some compassion for the monks of Lindisfarne Monastery who looked out one dreary morning and saw a host of ships just like these ones, full of big hairy men waving swords and axes while descending on their shore, ready to do really unspeakable things to them, like steal all their precious stuff, burn their books and poke them with swords or capture them as slaves. On a related note, but interrupting my train of thought, did you know that back in 1000AD, at the height of Viking era, a good Viking sword was worth as much as a Ferrari or Aston Martin is now? 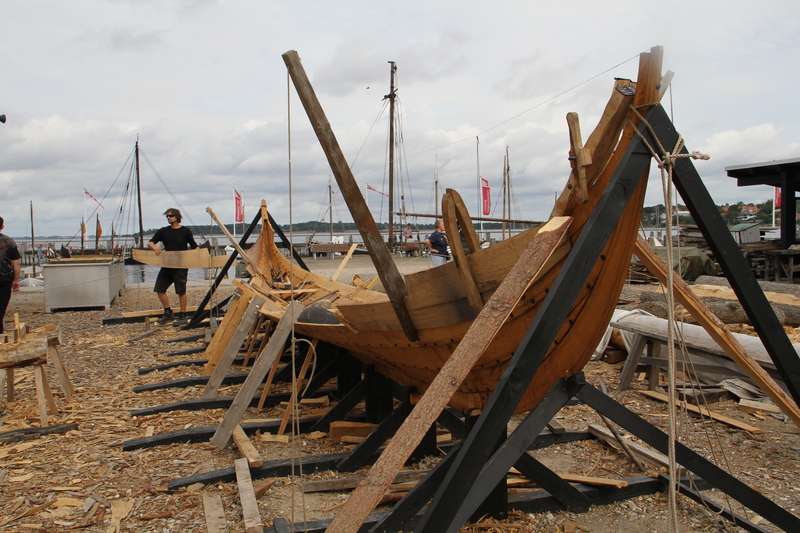 But back to Roskilde, there is a networks of jetties and on the bank nearby, several longships are under construction by craftsmen using original techniques and traditional tools. The air rings to the sound of axes and adzes cutting into spruce and fir tree logs. It really does make you start to feel you are slipping back in time. 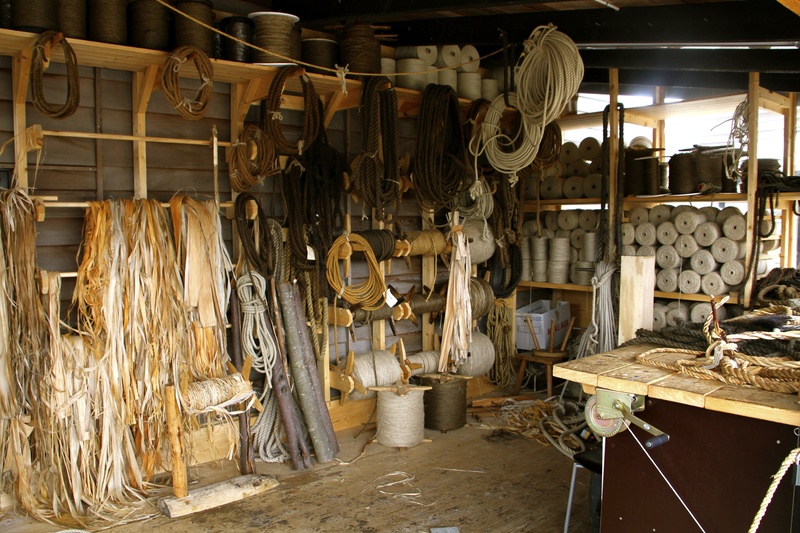 A shed nearby is filled with rope making equipment, and a blacksmith works pumping his forge, the way blacksmiths have done for thousands of years, to produce the metal fittings needed for the ships. The smell of the burning coke really adds to the authentic atmosphere, and nearly hides the smell of pickled herring that are for sale in the canteen not far away. Nearly. 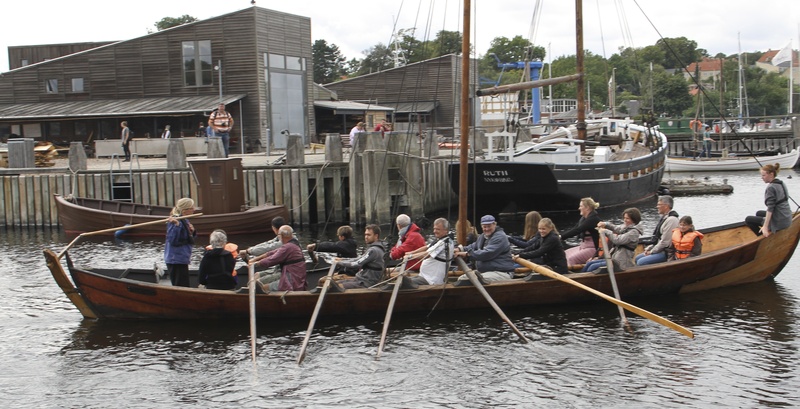 I had read before visiting that the boat builders at the museum offered daily sailing trips on one of the traditional, Nordic boats. Everyone participates actively with rowing, setting the sail and carrying out other sailors’ work. Unfortunately, like many events, you have to be there early, and by the time we arrived the ship was booked out. “Røvpule!” I said in my best newly-learnt Danish. Disappointed, (I was, but I’m not so sure about Jan) we stood on the jetty and watched as all the wannabe Vikings got kitted up in life jackets, given health safety lessons and instructions on handling an oar before they set off rowing out into the harbour. Unfortunately for them, precious little wind was blowing, so instead of using the sail to get out to sea, they had to row and row and row and row some more. Eventually, when their boat was a tiny speck on the horizon, they did get to haul up the sail, but by that time most of them would have been well buggered. Or jumped overboard and drowned in relief. It looked like really, really hard work, and as most of them were obviously novice rowers, oars went in all directions. I was reminded a bit of an orchestra conductor’s baton conducting the Ride of the Valkyries. Da dum dar dar dar dar. 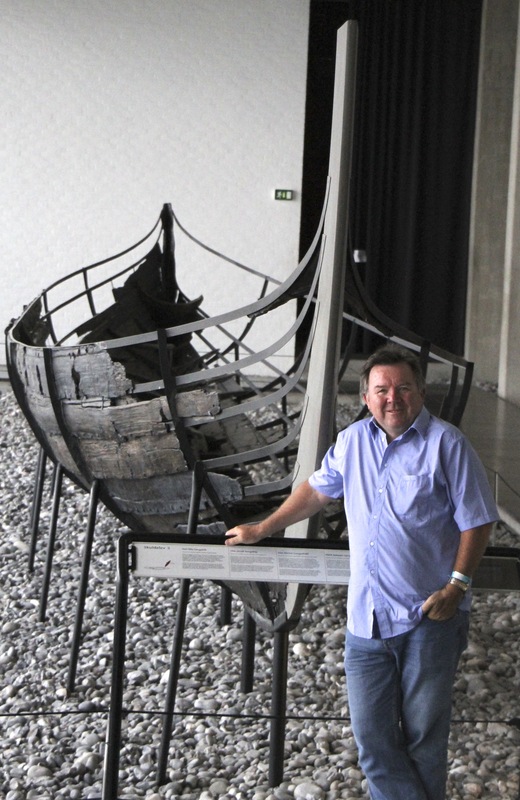 The main museum building itself has three impressive longships which had been discovered in the mud in the harbour only metres away from where they are now in display. 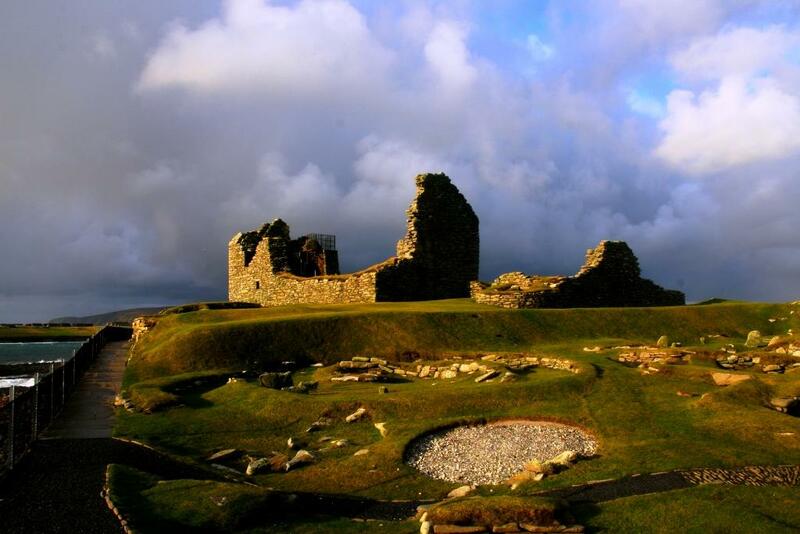 It turns out they had originally been scuttled to block the harbour and prevent raiders landing and, again, doing unspeakable things to the inhabitants. Viking were not only beastly to English monks, but also to each other. It seems it didn’t much to upset a neighboring tribe and before you knew it, they were descending on your settlement with swords and axes on high with murder in mind. 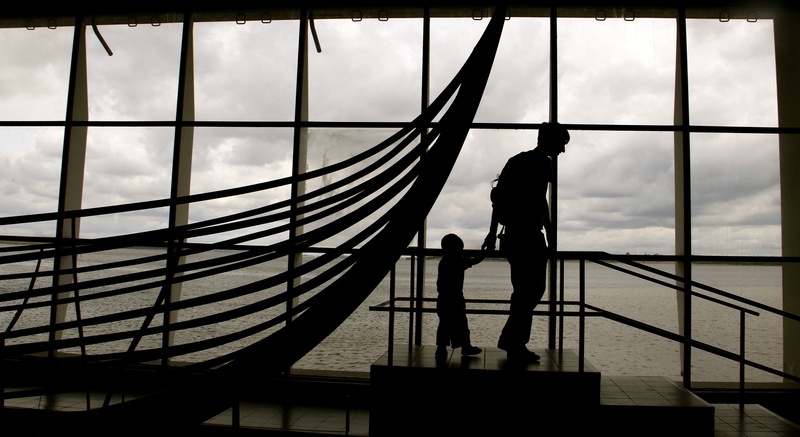 The mud on the seafloor preserved much on the timber from the longships’ planks, and a thousand years later you can reach out and touch history, providing you ignore the Do Not Touch signs and the guards are not watching, of course. 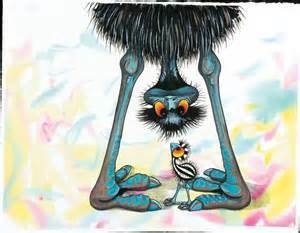 If they did see you, you would probably score a battle-axe to the skull for your trouble. 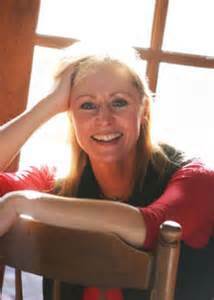 They take their Viking history very seriously in Scandinavia and even though the people seem to be gentle, sophisticated souls these days, you have to remember that Viking DNA is still running through their veins. 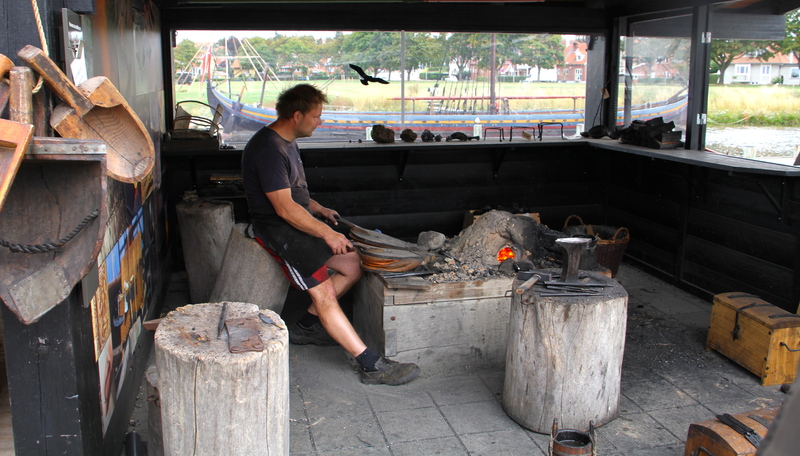 Categories: classroom resources, Research, Viking history & myth | Tags: Fremantle Press publishers, James Foley Norman Jorgensen, preserved Viking longships, recreated Viking longships, Roskilde Denmark Skandinavia, Roskilde Viking Museum, The Last Viking, The Last Viking Returns, Viking Blacksmith's forge | Permalink. Few years ago when James and I worked on the early drafts and illustrations of TLV and really started getting into the Viking vibe, it seemed that James was most interested in the Norse myths and legends, whereas I had more a feeling for their history. James started amusing me, and no doubt small children, with his colourful tales of what the Norse gods were really like. The gods in our two Viking books are much more tame and civilized than the historical ones, though as I said before, James’ Fafnir the Dragon is a right piece of work. 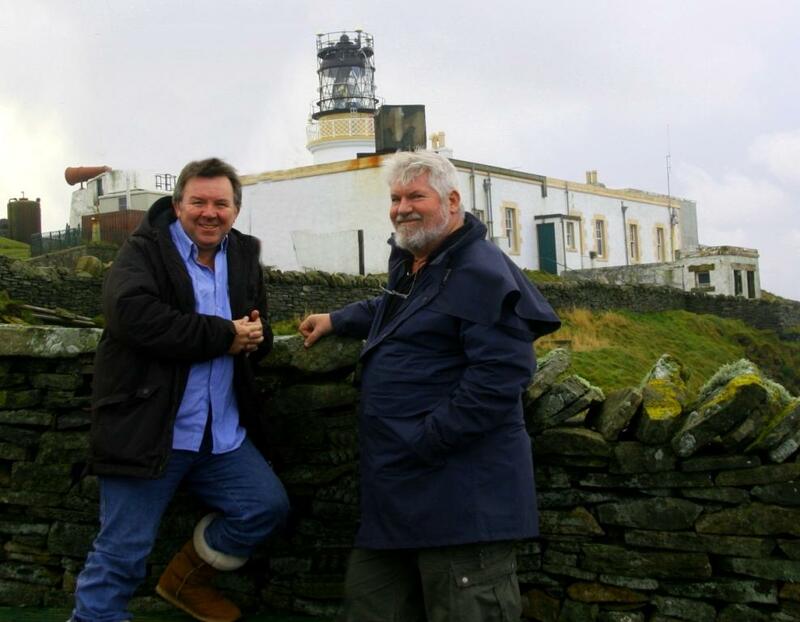 While James sharpened his crayons, I headed to Scotland on holiday with my good friend Allen Newton and decided to add on a week staying on the Shetland Islands. 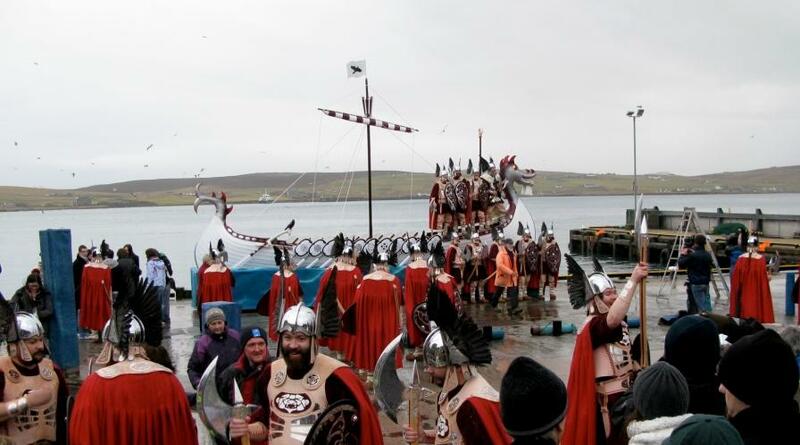 The islands are famous for Jarlshoff Viking ruins, a terrific Viking museum, Viking boat races and most of all, the annual Up-Helly-Aa Viking Festival held every January in the capital, Lerwick. I imagined I’d come away fired up with new found Norse passion. 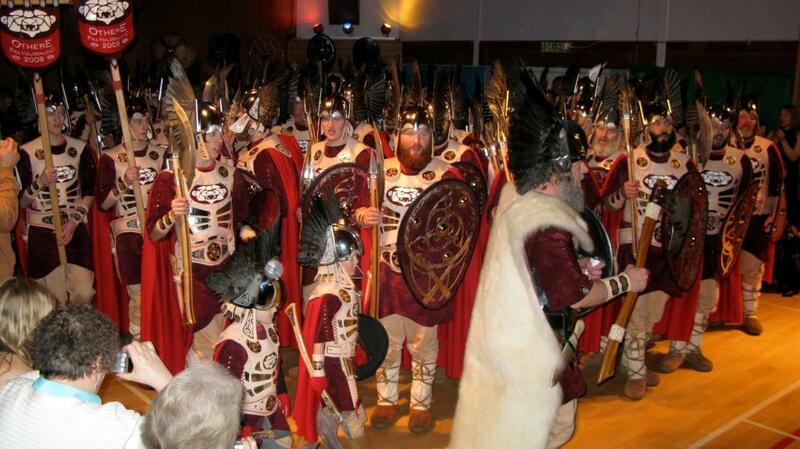 The Up-Helly-Aa festival is actually a year-long event with the locals spending eleven months constructing a full-size Longship, recreating Viking costumes and weapons and growing authentic looking beards. 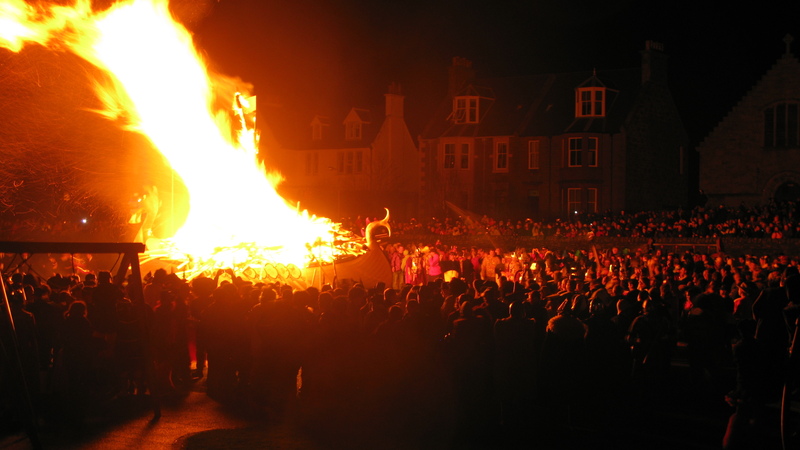 Then, at the coldest month of the year, they drag the ship though the streets of Lerwick to the local park where they ceremoniously set it alight, dance round the flames with much “merriment” and have a party that lasts for four days. With the amount of “merriment” it is said they put away, I imagine a few more days might be missing from the working week as well. With January that far north not really being an option (brrrr), Allen and I planned to be in the Shetlands at the end of August so we could see the thousands of puffins that colonise the cliffs near Sumburgh Lighthouse, the southernmost tip of the islands, so we sadly missed the festival by months. 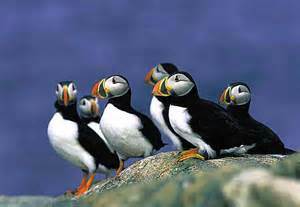 Even sadder than that, as far as Allen was concerned, on the day before we arrived, the final puffin flew off south for the winter, according the lighthouse keeper (“you should have been here yesterday”), so we missed them as well. All that way. It was actually a 12-hour overnight ferry crossing in a Force 9 gale. The redeeming feature in this story is that while we there exploring the islands, the weather wasn’t too bad, in a Northern Hemisphere kind of way. 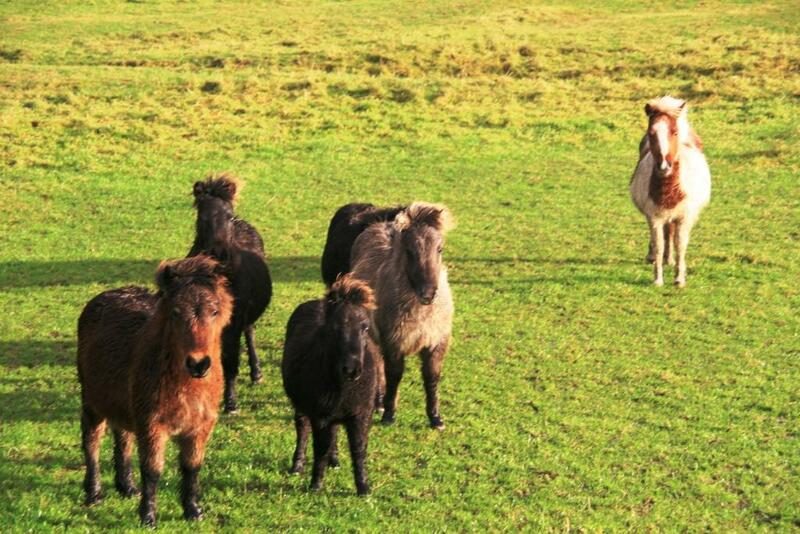 The Shetland Islands are notorious for abysmal weather, with snow, sleet, rain, hail, and hurricane force winds all arriving at the same time, and as the islands are little more than grass-covered, barren rocks sticking out of the remote North Sea, shelter from the weather for the thousands of hardy Shetland ponies that inhabit the place is limited. The Vikings chopped all the trees down a thousand years ago so little natural shelter is available other than the thousands of ruined stone cottages and dry stone walls. The locals, too, are famous for their grit and hard living, surviving over the centuries on fishing and collecting peat bog. 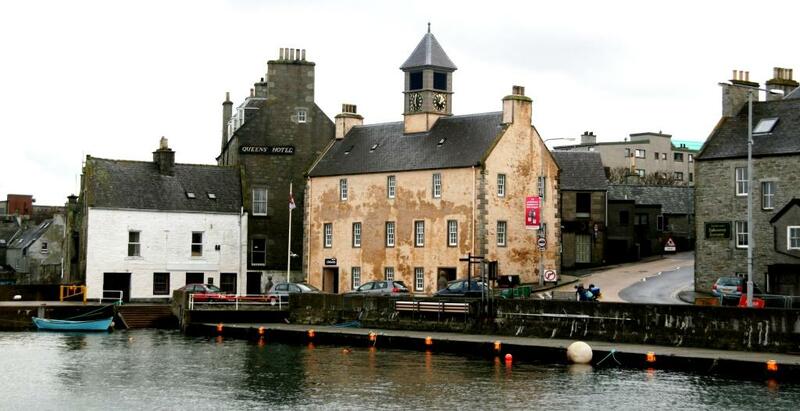 In recent years, though, with Lerwick being used as a base by North Sea oil rig tenders, the economy has boomed beyond belief, and heated swimming pools, sports centres, wide roads and good schools have become a feature in almost every tiny village. 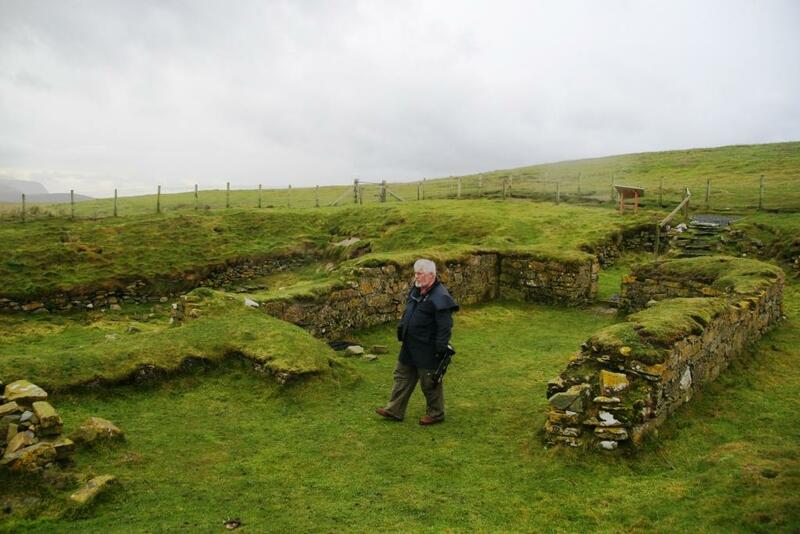 Until Allen and I went there, I had not met anyone who had visited the Shetlands, but since coming back, I have found that two of my friends have done so in recent years. 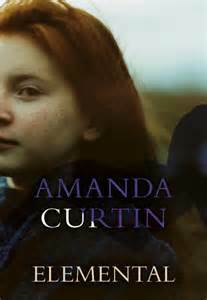 First was the lovely Amanda Curtin, the extremely polished writer of The Sinkings, a haunting novel set in Albany, and the equally moving and atmospheric, Elemental, published last year, and which is set in Fremantle but starts in the Shetlands, where she did a lot of research. 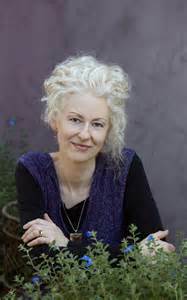 The other friend is John Cusack, an internationally renowned architect, who has traveled all over the world on building projects, including one in the Shetlands. 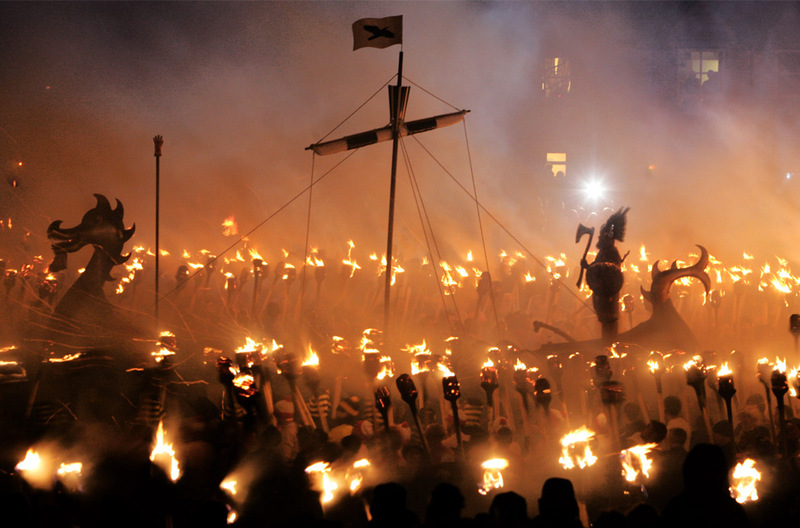 John was lucky enough to be there on a recent January and took these fabulous photos of the Up-Helly-Aa Festival, and kindly shared them with me. 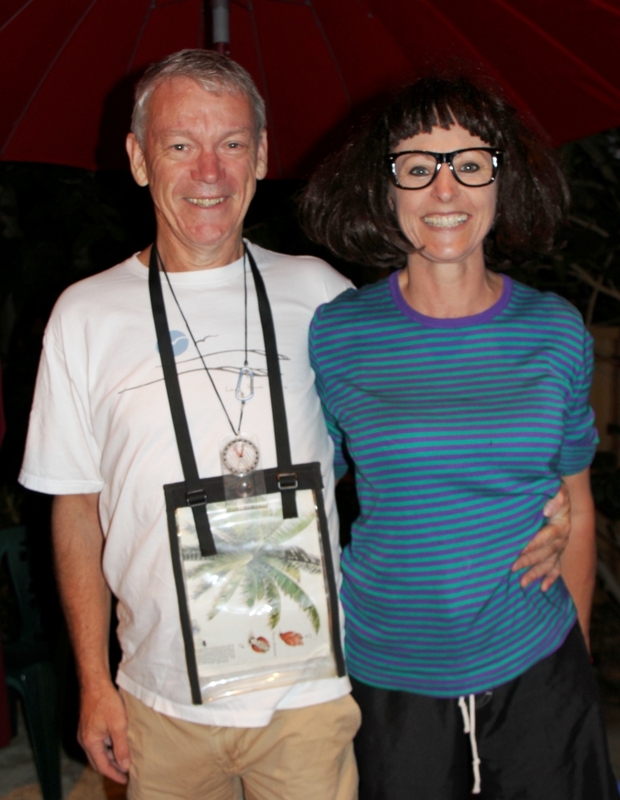 John is also lucky enough to be the partner of the famous, award-winning creator Wendy Binks, mother of Stripy the Emu and owner of the fabulous Stunned Emu galley on the Cappuccino Strip in Fremantle. 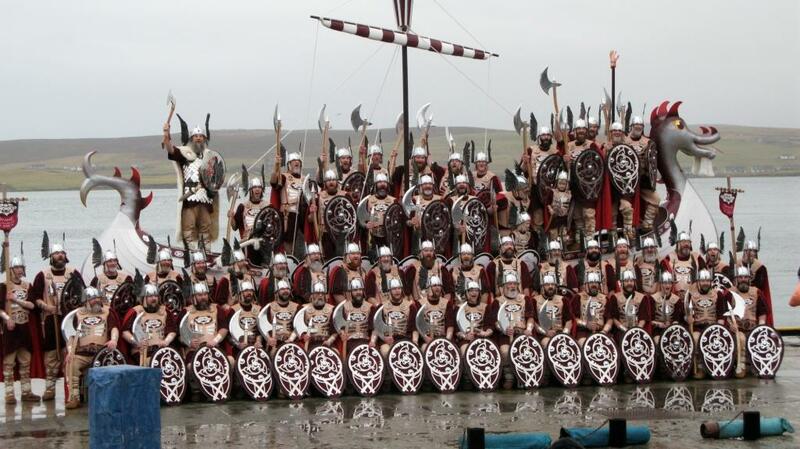 Categories: classroom resources, Research, Viking history & myth | Tags: Allen Newton, Amanda Curtin, Bombay Vikings, Festival, James Foley, Jarlshoff, John Cucack, Lerwick, Norman Jorgensen, puffins, Shetland Islands, Stunned Emu Gallery, Up Helly Aa, vikings, Wendy Binks | Permalink.